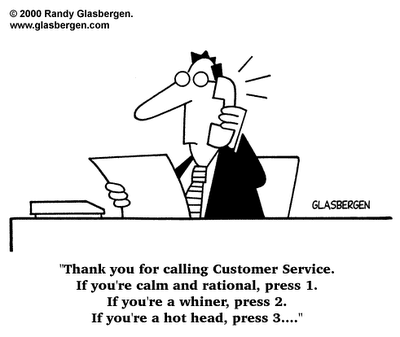 Are customer service programs for you? Over the years we've studied with interest what makes great customer service. Some companies, like Disney, have an extensive training program for employees that teach specific actions and attitudes required to deliver an exceptional customer experience. Others have attempted to imitate this, but have missed the mark by focusing on scripts instead of a mindset of service. I recently experienced this at a national retailer. Having scoured the floor for someone to help, I finally found someone to let me into the dressing room. While the clerk had paid no attention to me whatsoever (though there were hardly any other clients to tend to), when I finally made my purchase, she was quick to recite the required script inviting me to go online and rate her service as excellent. I found it even more ridiculous to hear her answer the phone using the requisite (but unconvincing) script about the excellent service one could expect when shopping at this store. Creating an exceptional customer experience requires considering every touchpoint a client has with a brand. Organizations that focus on syrupy scripts but who fail to train their workers on their products and on their service standards come across as shallow and disingenuous. and who care about their work. Like common sense, people seem to either have this ability—or not.